Google Fi Reviews: Will This Phone Plan Be a Good Fit for You? Google Fi is a wireless service from Google that offers data plans with flat-rates for unlimited talk and text, and a $10-per-GB charge for data that transitions to unlimited after certain usage levels. Google Fi Review: Will This Phone Plan Be a Good Fit for You? Google Fi is Google’s mobile carrier that offers flat rates for unlimited talk and text along with a per-gigabyte data charge for their no-contract plans. What makes their particular product unique is that you’re actually connecting to any one of three different networks that your service bounces between based on availability: Sprint, T-Mobile and U.S. Celluar. Up until Nov. 2018, the service was known as Project Fi and was limited to certain phones. In Nov. 2018, Google rebranded the service as “Google Fi” and provided compatibility more phones than what they offered under Project Fi. Like any mobile service, Google Fi has its strengths and weaknesses. We’ll cover those aspects of the service in this review by providing our analysis of how much it costs, which phones you can use and how it compares to other wireless services. At the end of our review, we’ll provide you with some thoughts on who might be the best candidate for Google Fi. As a Google Fi customer, you have two possibilities for service and which service you get is based on which kind of phone you have (more on that later). Some phones get the luxury of receiving Google Fi’s multiple carriers, in which they’ll connect you to either T-Mobile, Sprint or U.S. Cellular depending on which carrier provides the best service for the area you’re in. Also, you’ll be able to use your phone as a Wi-Fi hotspot. Other phones will only connect to T-Mobile's network and do not get access to Wi-Fi hotspots. This mobile phone service combines two charges into one bill. First, you’ll pay $20 for unlimited talk and text. For every additional person you add to your plan, you’ll pay $15. Google will charge you $10 per gigabyte you use each month. So, if you use 3 GB, you’ll pay $30 in data charges plus $20 for talk and text, resulting in a pre-tax bill of $50. Google notes that taxes and fees will be anywhere from 10% - 20%, which means that $50 bill will be between around $55 to $60. Keep in mind that Google rounds up your data usage to the nearest tenth of a GB and will charge you based on that round-up. If you use 2.7 GB, they’ll charge you $27. Data costs the same when you’re overseas, but phone calls over the network will cost $0.20 per minute. Pro tip: You don’t have to pay for SIM cards and, at the time of publishing, Google Fi was offering new customers a free first month of service. So, if have four people on your plan and you surpass 14 GB in the first week of the billing cycle, you won’t have to pay any more data charges. Your bill will be $205 for what amounts to unlimited data. Google’s fine print notes that your data will slow down after you surpass 15 GB of content. That same fine print says that “less than 1% of individual Fi users (as of Jan. 2018)” use above 15 GB. Google says you can opt out of the speed slow-down but, in order to do so, you’ll need to continue to pay $10 per GB from 15 GB on. 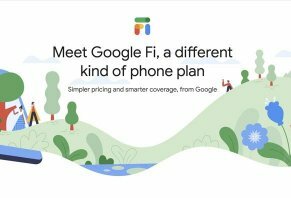 Unlike most mobile carriers that allow you to bring pretty any phone you want to your plan, Google Fi’s service only works on certain phones. Of those phones that do work with Google Fi, only certain ones will have access to three networks and Wi-Fi hotspots. The others, as we pointed out earlier, will only be able to use T-Mobile's network and you won’t get to use your phone as a Wi-Fi hotspot. Google Fi’s website sells phones, many of which include bill credits ranging from $100 to $300. You can purchase the phones outright, or go on a 0% interest payment plan that requires a credit check in order to get the payment plan. Based on our research, most of the newer phones from Apple, Samsung, Google, Motorola, Huawei, HTC and LG work with Google Fi. Based on the data we presented in this table, we believe that there are some very distinct differences between Google Fi and the other providers. First, Google’s billing works differently than the other five carriers in the chart. If you want an unlimited plan, then you’ll end up paying (taxes included) at least $25-$65 more than the other carriers. However, Google Fi gives you the distinct advantage of paying per GB. So, if you only use 2 GB of data per month, then your bill will be $55. However, with TextNow offering an unlimited plan for $39.99, it doesn’t make much sense to use Google Fi if you’re looking for the best bargain. Another thing to keep in mind is that Google will slow down your data once you hit 15 GB in data usage. It’s not a big deal if you don’t use 15 GB a month, but, if you exceed that, then you’re going to have slower data speeds at least 7 GB before users from the other carriers will. The one advantage that the other carriers have is that they may or may not slow down your speeds once you hit their data cap. Google Fi, on the other hand, will slow down your speeds to between 2G and 3G, which could make your apps and streaming painfully slow. In general, we believe the data shows that the major carriers and independent carriers like TextNow provide better value for those looking for a phone with a data plan. Our analysis of Google Fi indicates that there are some distinct disadvantages to using Google Fi. Other mobile carriers like TextNow provide far better value for single-line unlimited data plans and data plans for families of 2-5 people. One of the crippling aspects of Google Fi, in our opinion, is that they have high data prices and a limited number of phones that can work with their plans. In most cases, you can use old and new phones. That isn’t the case with Google Fi; many of the older phones we checked weren’t eligible. In general, our impression of Google Fi, based on our research, is that it’s a novel idea because Google is a well-known name but their high prices make other companies a better choice for unlimited data for individuals and groups. However, we do believe that there are a few situations in which Google Fi might be a good fit for you. For example, if you like mainstream companies and aren’t interested in an independent carrier like TextNow, then Google is a good fit, especially if you only use 1-2 GB of data each month. If that’s you, then your monthly bill will be, at most, $50. One of the worsts customer service I have seen is from Project Fi people. Waiting on the new phone for 5 weeks. It got lost in the transit. The investigation is still open in Project Fi. They started charging for the phone in my account. Called customer service, they said they cannot do anything about the cost being charged in the account until the investigation closes out with their third party shipping company. Asked for the supervisor, she said the same thing, we have to wait until shipping handles this. I asked for the shipping number, and she said shipping doesn’t have a number that we can give to customer service. I asked her for her manager who can resolve this situation since it has been 5 weeks. She says, "I am the highest authority that you as a customer can talk to," and she hangs up the phone. So basically, I talked to the head of Project Fi, who cannot do anything regarding my account being charged falsely. We are paying for the phone that we haven't received. and there is no remedy from Project Fi. I do not recommend dealing with Project Fi anyone. This the worst customer service company. Going overseas? It works there! We just completed a 6-island Caribbean cruise and I was impressed. When we got into port I fired up my phone and it immediately told me the price of a call, 20 cents a minute. I sent a lot of cellphone pics and movies to the family in the USA at NO CHARGE! I checked on my phone each day and it showed each call and the cost. Exactly what I expected! Very happy about cost and use inside the USA also. Be sure to find a friend or relative who is on Google Fi as both of you get a $20 signup recruiting reward. Write a Review for Google Fi!